There is a reason that comfort foods are comforting. They tend to be high in fat and simple carbohydrates, which send our brain chemicals flying, and they do comfort us – temporarily. But they aren’t always the best food choices, and often I set out on a mission to find a way to enjoy the foods I love, reinvented into a healthier, but still just as satisfying, version. 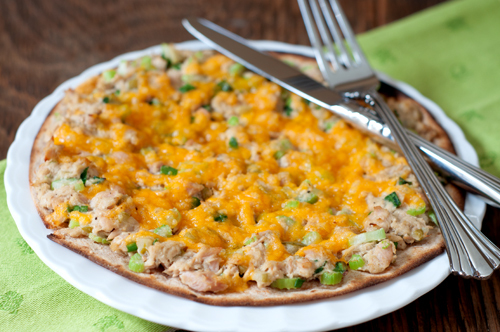 Tuna melts usually have three components that trip us up nutritionally: they come served on a white English muffin, they are loaded with mayo, and they are topped in far too much cheese. I made just a couple of simple changes here: swapped the English muffin for a whole grain tortilla, swapped out some may for some healthier mustard and extra virgin olive oil, and reduced the cheese on top. Make sure to use bold flavors so that you feel satisfied. I built my tuna salad with green onions, garlicky dill pickles, and Dijon mustard to amp up the flavor. This is simple lunch food that you’ll feel good about eating with no regrets! 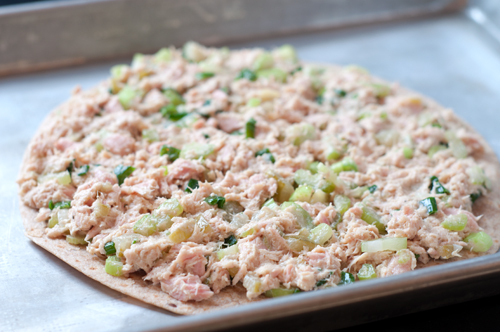 Combine the tuna with the celery, onion, pickles, mayo, olive oil, and mustard and stir until mixed well. Season with pepper to taste. 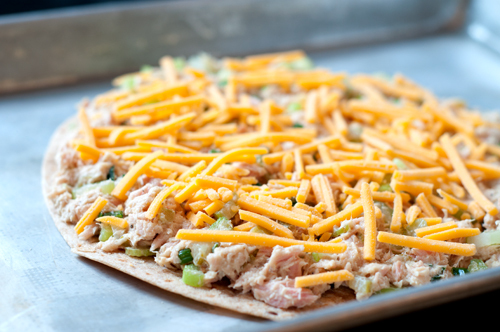 Spread the tuna salad onto the tortilla and top with the cheese. Broil until hot and bubbly, taking care not to burn, about 2-3 minutes. Michelle, love this idea! I made the effort this year to lose a lot of weight, but I miss feeling indulged sometime. I will be making this!